This book contains a major statement by one of America's most preeminent sociologists on what remains an important problem in American history and social analysis: the nature and extent of movement within American society from one status to another. The most important images of mobility involve self-improvement by changing location (going to the frontier, coming to the big city), and by changing social class (second-generation immigrants). Almost all sociological and historical analysis has been limited to these themes. 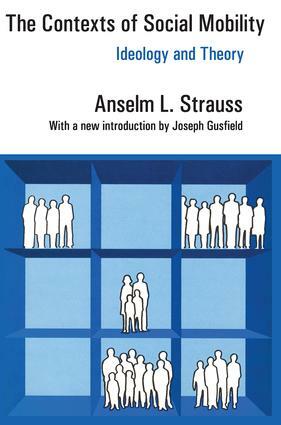 Strauss extends the concept to a wide range of ideologies, institutional contexts, and social movements; his analysis is based on a formal theory of status passage and develops a partial theory of mobility. Strauss addresses a theme that underscores much of one strand of his work: the changing articulation of individuals with their social structure and institutions. The book follows on from the theoretical presuppositions of Discovery of Grounded Theory and the formal theory presented in Status Passage. Strauss was continually concerned with American social and intellectual life in its historical and contemporary manifestations. No one else has looked at the important phenomenon of mobility in this broad a context and from this point of view. The book remains important to those concerned with the social history of America and with problems of social change.